Remember the line from that Garth Brooks song - "When he told her he would be riding, she said 'I don't care if you never come back from Cheyenne'." I am here to tell you, I am happy to have made it back from Cheyenne! Last week VP Mark Kitchen and I represented the community colleges at the legislative session with Western Wyoming Community College President Karla Leach. Week two of the legislative session was budget week - which meant several long nights, eating on the run, and lunch at Albertsons. In addition to the legislative session VP Kitchen, Trustee Nada Larsen and I attended the Wyoming Coalition Against Domestic Violence and Sexual Assault annual awards ceremony where Cynthia Garhart was presented the Partners in Advocacy award for the work she has done to change NWC's culture regarding sexual misconduct on campus. 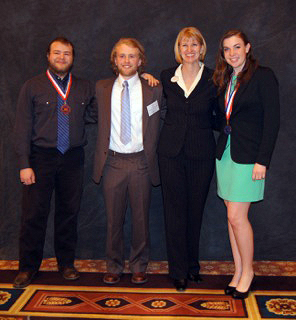 The following evening, I had the honor of presenting the nominees for the Phi Theta Kappa Wyoming All-State Academic Team. Elijahben Jasso and Makenzie Beck (pictured below) are NWC's nominees. They will compete at the national level to be included on the All USA Academic Team in April. Student Senate President Sam Jones (pictured below) was also honored at the Wyoming Community College Trustee Legislative Reception as Northwest College's student of the year. HB 80, our stable funding bill, passed in the house this week and has been referred to the Senate Education Committee. Click here for a status update of the bills we are tracking. I am inspired by the fact that in Wyoming we truly have a citizens' legislature. As a citizen, I have the opportunity to talk to our legislators about our community colleges. We are lucky to have the opportunity to participate in the process at this level. I love being a part of the process and enjoy interacting with our legislators. BUT it is always nice drive over the hill, see Heart Mountain in the distance, and know that I have made it back from another trip to Cheyenne.